How to Take Senokot Max Strength Tablets: For oral use only. Adults, the elderly and children over 12 years: swallow 1 tablet at night. Do not take more than 1 tablet in any 24hr period. Children 12 years and under: not recommended. Do not take more medicine than the carton tells you to. 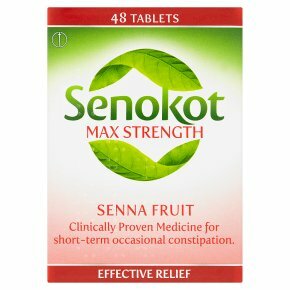 Senokot Max Strength Tablets usually act within 8-12 hours. If symptoms worsen, if there is no bowel movement after 3 days, if laxatives are needed every day, if abdominal pain persists, or if other symptoms persists, consult your doctor. Use for more than 1-2 weeks requires medical supervision. See enclosed leaflet for further information. WARNINGS<br>Do not take this product if you:<br>Are allergic to any of the ingredients<br>Have bowel or stomach problems<br>Are pregnant or breast-feeding<br>Have a kidney or heart condition<br>Are under 12 years of age.<br><br>Keep out of sight and reach of children.